I’m On The Colbert Report! Sort of. 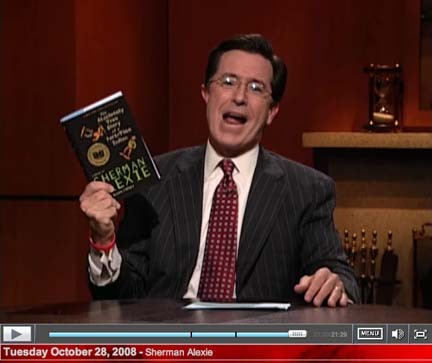 Stephen Colbert interviewed Sherman last night, and held up a copy of Absolutely True Diary. You can see my name if you kind of squint! Thanks for the heads-up, Amy! I finally decided to make a video of me folding and unfolding a few different designs of my custom wedding invitations. My most popular design, the “tri-fold,” is especially hard to conceptualize from 2-D drawings. This action-packed flick will be on the “Wedding Invitations” page of my site as soon as it’s updated (any minute now!). For the first couple takes I still had chipped blue nail polish on. Oops! Not that I needed a fancy manicure (though that would’ve been nice!) but if nothing else it was distracting.